You'll have gathered by now that I got these replacement dials from Superdial (London). I don't have anything to cpmpare them to, but the quality looks good and a bonus is that they completely replace the existing plates - so if you want to return the bike at a later date, then no probs. Installation was easy and they come with full instructions. Getting the clocks off the bike is fairly straightforwards. Splitting the clocks is only slightly more difficult. Remove 6, or so, screws from the back anf the pod is ready to separate. Because there is a rubber seal between the pods, then it can be a bit sticky. Once apart, the internals come out as a single unit. The instructions tell you to lift the needle over the stop, but there was not enough play in my clocks to allow this - so either remove the needle stop or turn the needle anti-clockwise. You need to mark the neutral (rest) position to allow the needles to be re-fit. I opted to lever off the needles (as shown above), since again there was not enough play to get a pair of pliers under the needle and onto the spindle. Paint the needles - in my case anyways, since white on white otherwise. Reassambly is the reverse, and heres the finished product. Contact Rob at Superdials or visit the Website for details of what they can do for You. Please, remember to say that you saw them on this website if you place an order. 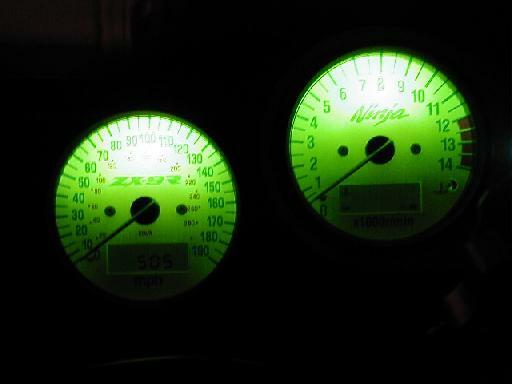 Paul Mylhill - added green bulbs to white dials.